The Travel Club offers travel to members all year round to a range of exciting and varied places including markets, events, tours, shopping, theatre, seaside, scenic routes etc. The Travel Club has a large membership of people of all ages and abilities and the club welcomes new members throughout the year. 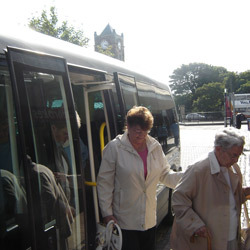 Aimed at elderly and people with disabilities in our community, each trip is a very social event with chat and a good atmosphere and routes are kept interesting and are driven by our friendly, experienced, qualified drivers. 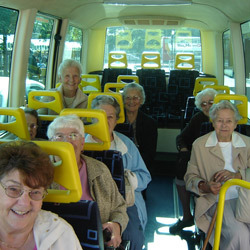 Trips start at £12 per seat and some trips include entrance fees where applicable. If you travel in a Wheelchair or take a Scooter you will only be charged for your seat and not for the lost seats removed. Always popular with existing and new members, trips fill up quickly once the quarterly trip sheets are received through the post. Click here to see the current trip list. There is a £5 annual membership fee taken when new members join and in January each year. The reason for having a membership fee is to underwrite last minute seat cancellations that cannot be filled. If a seat is cancelled at the last minute and nobody can be found to take the seat the person cancelling the seat is not expected to pay if they are not going to travel and the collective membership fund covers that cost. The fee, and the trip fees, also goes toward advertising, promotion and general running costs. Remember we are a non-profit, non-commercial Charity whose main aim is to enhance our community and the people living in it so please continue to support us. So if you want to get out and about, meet new people and visit some lovely places in our region, just give us a call.